Images of recent impact craters taken by the HiRISE Camera on the Mars Reconnaissance Orbiter have revealed sub-surface water ice halfway between the north pole and the equator on Mars. While the Phoenix lander imaged subsurface ice where the top layer of soil had been disturbed at the landing site near the north pole, these new images – taken in quick succession, detecting how the ice sublimated away — are the first to show evidence of water ice at much lower latitudes. Surprisingly, the white ice may be made from 99 percent pure water. “We knew there was ice below the surface at high latitudes of Mars, but we find that it extends far closer to the equator than you would think, based on Mars’ climate today,” said Shane Byrne of the University of Arizona, a member of the High Resolution Imaging Science Experiment, or HiRISE camera. Scientists used several instruments on MRO to take a series of images, detecting and confirming highly pure, bright ice exposed in new craters, ranging from 1.5 feet to 8 feet deep, at five different Martian sites. The images here were taken of the Arcadia Planitia region, located northwest of the Tharsis region in the northern lowlands, at 40-60° North and 150-180° West. The before and after HiRISE images show a fresh meteorite crater 12 meters, or 40 feet, and reveal how water ice excavated at the crater faded with time. The images, each 35 meters, or 115 feet across, were taken in November 2008 and January 2009. 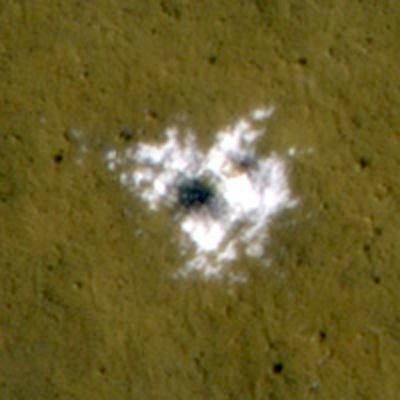 The discovery of these “white” impact craters began in August 2008, the orbiter’s Context camera team examined their images for any dark spots or other changes that weren’t visible in earlier images of the same area. Meteorites usually leave dark marks when they crash into dust-covered Mars terrain. 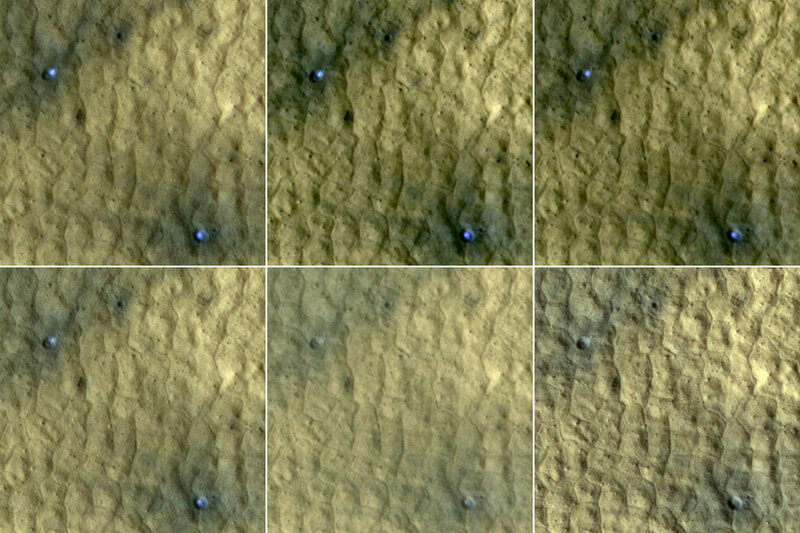 The HiRISE team followed up in September 2008 by taking high-resolution images of the dark spots. 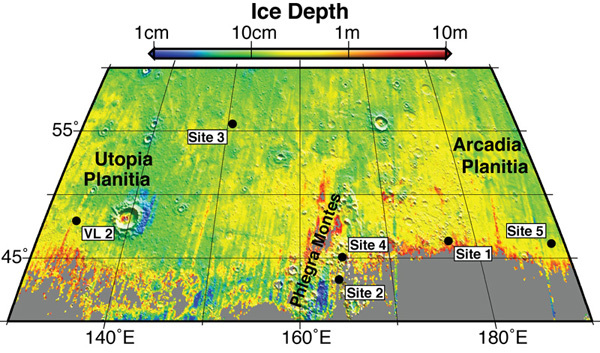 A few days later in September 2008, the orbiter’s “CRISM” team used their Compact Reconnaissance Imaging Spectrometer for Mars and got the spectral signature of water ice exposed in one of the impact craters, further clinching the discovery. While Phoenix’s discovery of sub-surface ice was not totally unexpected, finding highly pure ice far closer to the equator because of random meteor impacts was unexpected, he said. There are several theories about how a layer of such pure ice could have formed beneath Mars surface. Byrne said he thinks that one of the most promising ideas is that this ice on Mars formed in the same way that pure ice lenses form beneath the surface of the Earth. “That’s where you have very thin films of liquid water around ice grains and soil grains and they migrate around to form clear ice lenses on top of the ice table, even at temperatures well below zero. This process is called ‘frost heave’ on Earth, and it’s considered a nuisance in most places because it cracks up roads and tilts walls and destroys foundations of houses. “But on Mars it would be of great interest if we could discover a process that involved liquid water in today’s climate, and not just in some of the warmest areas of the planet but in some of the coldest areas of the planet in the high latitude regions,” Byrne said.